After spending 5 lovely months in Bar Harbor it was time to head South before the arctic cold arrived in Maine. Our first day of driving led us to Hampton Beach State Park. 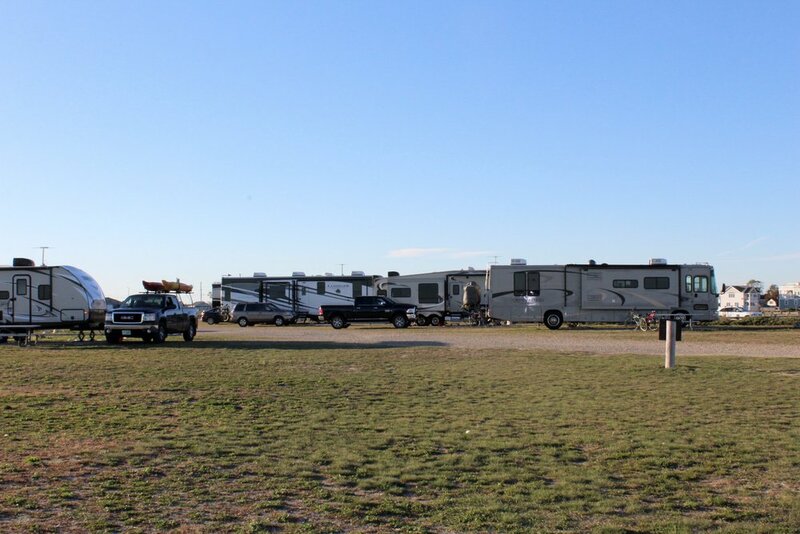 Many of the campgrounds in the area closed on October 15, so it was a bit of a challenge to find a place to park & plug in for the night. Lucky for us Hampton Beach State Park Campground was open until the end of October. That fit the bill for us and while they were open they did not take reservations. In that we would be arriving on a Tuesday, we didn’t anticipate a problem and the lady we spoke to on the phone seemed to think we would be able to snag a site fairly easy. She was correct and we arrived and picked out a nice, level, gravel pull-thru to call home. The campground is small with just 28 sites, but its location is prime right where the Hampton River meets the Atlantic Ocean. It was beautiful and you could catch both the sunrise and the sunset from many of the campsites. There were not many available amenities for the price paid, but with the beach a quick walk over the dunes what amenities could really compete! The sites are close together without privacy between sites. During our stay the weather was chilly, but during the warmer summer months it may get warn as there would be no shade at the campground. If you are looking for a oceanside stay in New Hampshire, look no further as Hampton Beach State Park Campground fits the bill. Pet owners, do be aware that no pets are allowed in the campground from April 1st - September 15th.